The story of David and Goliath begins when the Philistines gathered their armies together to fight against Israel. The camps of the Philistines and the Israelites were on two opposing mountain tops with a valley between them. Out of the camp of the Philistines came a giant-- Goliath of Gath. He was ten and a half feet high and covered from head to toe with brass armor. 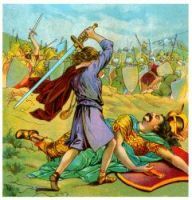 He challenged the men of Israel to choose one man from the army to fight against him. Whomever won the fight would make servants of their enemies. But the men of Saul's army were greatly afraid, and no one was willing to go out and fight Goliath. Meanwhile, David was feeding his father's sheep at Bethlehem. His father sent him to take provisions to the army where his brothers were fighting. 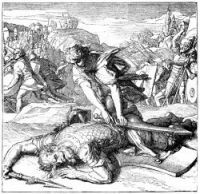 At Israel's camp, David learned of the situation with Goliath and volunteered to fight against him. Saul was skeptical, but David's faith and determination won him over, and Saul agreed to the battle between David and Goliath. 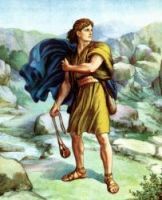 Saul even offered David his armor to wear, but David refused. He took his shepherd's staff, and he chose five smooth stones out of the brook, which he put in his shepherd's bag. With his sling in his hand, he approached the Philistine. On these pages you'll find twelve images of David and Goliath taken from my collection of antique Bibles and story books. You're welcomed to use these pictures of David and Goliath in your art. 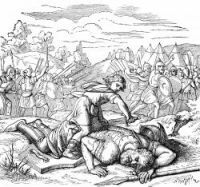 Click on the David and Goliath illustrations below to see more details about saving a free David and Goliath image or about purchasing the images of David and Goliath at a higher resolution.